The multistem version of Betula utilis jacquemontii is hugely popular for its aesthetically pleasing, year round interest. The glossy, green foliage turns yellow in the autumn before falling and giving centre stage to the sleek, white trunk and branches that stand bare and elegant against a frosty background. This multistem Himalayan birch tree will grow to 6 x 5 metres in 20 years and with its delightful, peeling white bark makes a wonderful multi-stem specimen ornamental tree. Hardy and tolerant of virtually all conditions, Betula utilis jacquemontii is worthy of any garden. Click here to go to the single stem Betula Jacquemontii. N.B. These are true multi stem trees that lead to the best trees in maturity. We do not adhere to putting 3 saplings in a pot to cheaply imitate them. Our pot grown multi stem Himalayan Birch trees can be planted at any time of the year. Start by removing weeds and grass within a metre of your desired planting hole. Dig a square hole as deep as your root mass and approximately 2x as wide. To help the tree establish more effectively, sprinkle root grow in the hole. Remove the pot, gently loosen the roots and place into the planting hole. Mix 50% of the original soil with 50% compost, fill in the hole and firm around gently. Avoid banking the soil up around the collar of the tree. See our help section for further advice. Once planted, keep the area free of competing weeds and grass for the first couple of growing seasons. 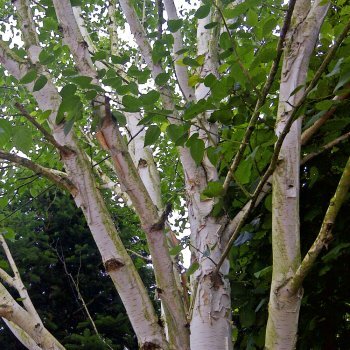 To keep the white bark on this Birch looking its best, you can wash it using a pressure washer (on a gentle setting), garden hose or slightly soapy water. Established multi stem Himalayan Birch trees do not require pruning and they do not take well to hard pruning. Hard pruning leads to increased light penetration of the roots which in turn results in increased soil temperature and decreased moisture levels. Simply remove the lateral shoots to maintain a clear trunk and prune any diseased or damaged branches. Pruning should be carried out in late summer to mid-winter. Birch trees bleed heavily at all other times of the year, especially late winter.